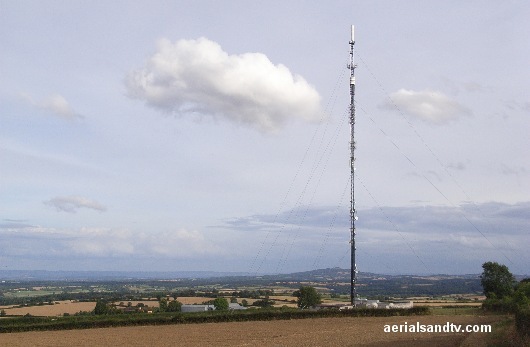 Ridge Hill TV transmitter is located 8 miles SE of Hereford and it is somewhat unusual in its location because there is no large city within 30 miles so its population coverage is only about 500 thousand. Where Ridge Hill is useful is as an alternative (importance of “line of sight”) to other transmitters which may be nearer. There are even people right up in Birmingham on Ridge Hill if the site just happens to have a decent view to the SW. Some of the transmitters to which Ridge Hill is often an alternative are Mendip, Wenvoe, The Wrekin, Sutton Coldfield, Bromsgrove, Malvern, Lark Stoke and Oxford and the channels for these transmitters are included on the Ridge Hill channel allocation guide which lists the transmitters frequencies. Note how they all “dove tail” together. The Channel Allocation Guides can be very useful in the diagnosis of co-channel interference problems and can also be invaluable if you are trying to find a spare channel for a modulated output (e.g. for a Sky box or CCTV system) to be added to your TV setup/distribution system without suffering from co-channel. As with all main transmitters Ridge Hill is horizontally polarised. It was originally an A group for analogue transmissions, before (temporarily) becoming a wideband whilst digital and analogue were being transmitted together, then finally reverting back to an A group when analogue went off. Most locations which received digital OK on a wideband aerial before switchover will still receive it at least as well (on that same aerial) after switchover. Switchover occurred at Ridge Hill in April 2011. Digital is broadcast at 20kW MUXES 1 to 3 (the PSBs) and 10kW for MUXES 4 to 6. Before the April 2011 switchover Ridge Hill`s digital power was only 2kW. The transmitter has eighteen smaller repeaters to improve its coverage in poor reception areas. Ridge Hill actually transmits MUX2 twice, ITV West on CH29 (but only to the South/SE ? ) and also ITV Central on CH25. Ridge Hill from an outer stay point. Close up of the very bottom of Ridge Hill, a cable stayed mast. Note that the design (the masts are usually mounted on a ball) allows a certain amount of movement which is necessary to enable the structure to sway slightly and thus avoid too much stress on the space frame steelwork. Note. There are huge forces on the base of “stayed” masts. This design of structure weighs between 150 and 250 tons (depending on the size) but the tubular types, e.g. Mendip, are about twice this weight. Then you have the additional force imparted by the tension on the stays, in approximate terms this would double the effective “weight”. For details of self supporting towers see Taylors of Oldham`s Catalogue. Ridge Hill television transmitter showing some of the fabulous views. 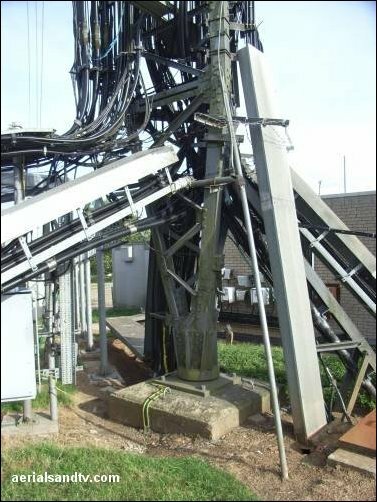 The base of Ridge Hill TV transmitter. Note the cables carrying all the various signals up to the transmitting aerials, also see picture below. 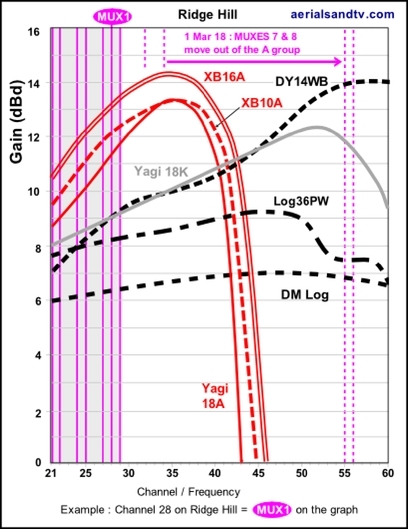 * Those with A group aerials who want MUXES 7 & 8 will either need to change their aerial for a wideband or Yagi 18K (but which has less gain), or add another (e.g. a Yagi 18E) using a CH38 diplexer as a combiner (see this article). 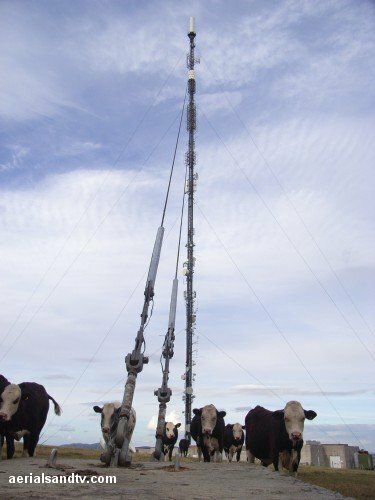 For Ridge Hill we recommend the DM log for strong signal areas, the Log36 or Yagi18K for medium signal areas, the Yagi18A* for outside installs in poor signal areas, the XB10A* for loft installations in poor signal areas, and the XB16A* for those with the most marginal signals. Unless you have a massive loft we`d normally recommend the XB10A over the XB16A for a loft install due the smaller size of the former aerial. The dimensions and test performance of the aerials can be found on the relevant tables. 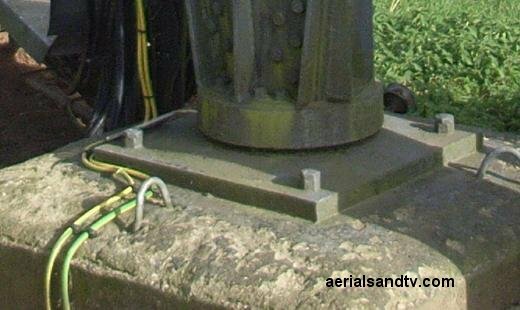 See the wrong aerial for any A group transmitter. Ridge Hill opened for VHF (405 line) transmissions of ITV in 1968, UHF broadcasting (on analogue) started in 1973 before being switched off (for only digital transmissions) in 2011. The height of the mast is 160m (a.g.l) and it has 4 sets of stays to keep it up, also see How High is High ? The site height is 203m and this gives wonderful views over to the east. Clearly visible to the NE is the Herefordshire Beacon (site of the Iron Age "British Fort") which has an altitude of 338m and if you get a chance to visit the latter I would do so as the views are stunning for almost 360 degrees. In fact the only obstructions are North Hill (397m) and its neighbour the Worcestershire Beacon which is the highest of the lot at 425m. Surely one of the best 360 degree views in the country. Note for those not keen on walking up mountains the Herefordshire Beacon is much the easiest to ascend ! The transmitter can be seen from miles around including from the M50 which runs about 5 miles to the South. The latter was opened (from the present Junc 1, A38 turn off) in 1960 and was extended Eastwards to the M5 (Northbound) in 1962. The Southbound M5 from this point didn`t open until 1970. The railway was what really put this area (The Malverns) on the map and the Worcester & Hereford Railway opened in stages from 1859 to 1861, this subsequently became the West Midland and finally part of the Great Western. The Ex Hereford to Ross line passes to the West and was opened from 1855 to 1964 and to the East the line from Ledbury to Gloucester opened in 1885, closed as far as Dymock in 1959 and the remaining stub to Gloucester in 1964. Also check Ridge Hill`s eighteenteen smaller repeaters.